Belle Vue | Launceston Then! Purse & wearing apparel £ 1 – 10s Two cows £7. Five labour horses with their tacking £15. Ten ewes & ten lambs £4. 10s. One reering sow 15s. Five fether bedds parformed £10. In cyder & ale £2. boxes, & other limber stuff £1. 15s. In cash & brewery vessels £1. 2s 6d. Corne growing & corne in the Mowhay & barn £14. Wood in ricks, in severall Places & other things & other things unseen & unpraised £2. 5s. From the above letter it is not clear whether the inn was destroyed or just converted, but it is known that the cottages adjoining the inn at the western end were destroyed in order that the new Dunheved Road could be built. The Dunheved Green reservoir was filled in in 1869 to continue the road to Badash. 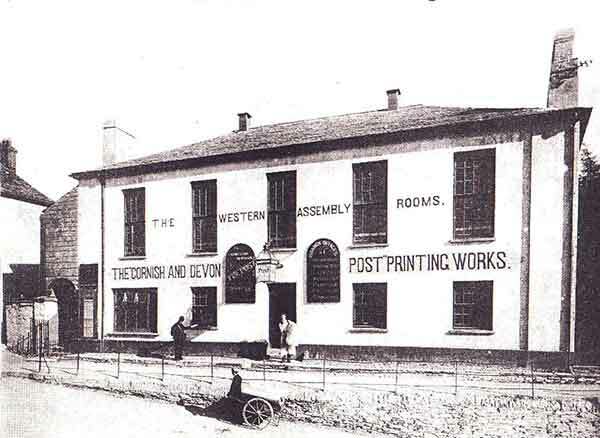 The building now housing the Cornish & Devon Post is built at an angle, showing that the road junction was by then in place. The building was first called the Western Subscription Rooms wherein ‘Happy Joe’ Maunder earned his sobriquet from the new, and much disparaged Salvation Army. It was used as the town court room, a general meeting room, a dissenter’s meeting place, and a cycle dealer’s shop before being changed for use by the Press. In June 1800 a number of young men passed their college examinations which entitled them to become preachers of the gospel; at that time each student, at the end of his last term was sent to a chosen place to preach for six weeks before being given a post. One young man was directed to Launceston, of which he had heard, and on being given his orders demurred, saying that he had heard bad things regarding the arguments and unrest at that place. His Tutor said that he was chosen specially because of this as the tutor believed that he was a man of peace and could bring tranquility to this area of unrest.. This young man, Richard Cope, agreed to go for six weeks and arrived in Launceston on 27th June, 1800, and preached his first sermon on Sunday 28th June, at the Congregational Chapel in Castle Street. He was then, in July, requested by the congregation to stay for 12 months, to which he agreed. The Reverend Cope now decided he liked the town so much he decided to remain longer, his congregation had swollen from around 200 to over 600 and he had to enlarge the area of his preaching to the outlying villages. The reverend gentleman took to preaching the gospel at South Petherwin, Truscott, Egloskerry, Yeolmbridge, Langdon, Tamartown, Polyphant, Holsworthy, Lawhitton, Bennacott, Northcot Hamlet, Boyton and Tamerton. He also held services in Callington at the request of the incumbent, the Rev James Messenger. This helped to bring his mind to bear on marriage and in July 1801, Rev Cope decided he could afford a wife and he was wed to Miss Davies, a member of the church in Chapel Street, Soho, London, by the Reverend J Maddy, the curate, in St James’ church, Piccadilly. Cope’s happy school soon became too big for Lawrence House and they moved back to Westgate Street around 1813, this time into the newly built Westgate Terrace, built on the site of a rather notorious ‘Lodging House’. The house was formerly the property of Mr Robert Watling who was more celebrated as the several times ‘Mayor of the Pig Market’. According to Mr Richard Robbins, he kept a rendezvous for German musicians, organ grinders and vagrants. He once offered Mr Pattison, landlord of the White Hart Hotel, to share with him some of his lodgers when he was full, and said he would take some of Mr Pattison’s when he could not accommodate them. The pig market was then held at Starcross, on the Square end of Westgate Street, the animals being tied to a ring on the Guildhall wall. There was a custom on Mayor choosing day of appointing a Mayor of the Pig Market; the person chosen for this dignified office would be first made tipsy by liberal amounts of beer and spirits and then proclaimed Mayor. His hat would be torn from his head, which would then be very well powdered with flour, and if his back hair were long enough, a frying pan would be tied to it and allowed to hang down his back. 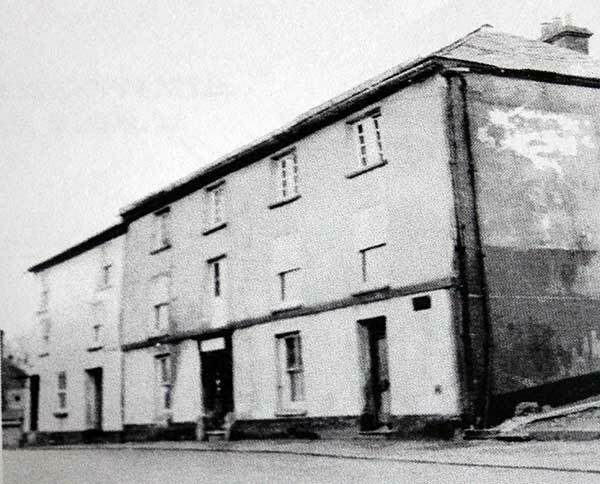 He would then be led away, being merrily pelted with flour by the attending audience, to the New Inn, the house later occupied by the proprietor of the Launceston Weekly News, which had the nickname of the ‘Shindy Arms’. This merry practice was discontinued in 1827. In 1820, the Reverend Cope’s stay in Launceston came to an end; the following is an extract from the Church Book of Castle Street Chapel, Launceston: June 24th, 1820.- the Rev R Cope, AM., gave in his resignation to this church, having filled the ministerial office over us twenty years as a faithful pastor, during which time the chapel was enlarged three times and the congregation continued to increase! He was made very useful in the conversion of sinners and in building up the church of the living God. He left us to fill a more important station in the church of God as Tutor at an academy in Ireland. The reverend was sent to the Irish Evangelical College at Dublin. LAUNCESTON, CORNWALL: To Be Let from Midsummer next. All that very Commodious House, situate in Castle Street, in the Borough of Launceston, now in the occupation of Mr G. M. Gifford, containing Drawing Room, Dining Room, Breakfast Room, 6 Bedrooms, 3 Atticks, 2 Kitchens, Pantries, Large Closets, Cupboards, and every other convenience. The Town Water is brought into the bedrooms. There is a small Garden attached, with Stable if required. Belle Vue House was put up for sale in 1872, while still in the occupation of George Mitchell Gifford who was the joint manager of the Tavistock Bank, agent for the Royal Farmer’s Fire & Life, and Scottish Provincial Life & Fire Insurance companies. George was also a founding member of the Launceston Volunteer Fire Brigade, serving as Secretary for many years. (The Post & Weekly News): For Sale by Private Contract: Desirable Freehold Property, in the Borough of Launceston. That well-known Residence “BELLEVUE” containing Three sitting and Six bedrooms, Two Kitchens, Cellar and all necessary Outhouses, a Conservatory, Gardens and Shrubbery, upwards of a Quarter Acre in extent (commanding delightful and extensive views, including the ancient Castle, St Stephen’s Village and Downs) the soils of which is of a highly productive quality, courtilage, & C.
ALSO the adjoining House, comprising Three Sitting and Bedrooms, with extensive Drying Lofts over, and to which a small garden is attached. These Premises are immediately contiguous to the new ‘Dunheved Road’ where villas are now erected and others contemplated, causing a great improvement in the western end of the town, they are well supplied with pump, town, and rain water, and the drains are in connection with the Town Sewerage. 14th March, 1896. TO LET. Belle Vue, Launceston,, late in the occupation F. J. Curtice, Esq, Surveyor of Taxes. The House contains about thirteen rooms, has a very large garden, wash houses, yards, and every convenience. Suitable for a family, The house is dry and the drains perfect:- Apply to G. H. Strike, Race Hill House, Launceston. Belle Vue House was taken down in 1957 so that the new Fire Station could be built on the site. In 2001 this fire station was declared unfit for modern fire fighting use, there being no room for training purposes or further equipment and a search was begun for a new site. In 2002 an area at Scarne, opposite Scarne Farm, was selected on a ‘green field’ site. The new station was handed over on Friday, 21 February, 2003, and the equipment and machinery was removed from Westgate Street and the new station declared ‘open for business’ on Wednesday, 26 February. The station in Westgate Street was then demolished in 2003 to make way for the present coach park. Bedford TK tender leaves Launceston Fire Station in the 1970’s. Photo courtesy of Gary Chapman.